Running to lose weight - will it work for you? Many have used this ancient technique to lose weight, but it hasn't worked for everybody. You Must Eat Less Too! Running to lose weight is great for both burning calories and a whole host of internal body effects that make it easier to lose weight (more on those later). But if you're still eating too much, no fat will be lost. A typical example of exercising but not losing weight is William Banting, a guy who's the great-great-grandfather of diet books. One of the first strategies he tried for losing weight was rowing. But that just made him hungrier, so he ate more. Choose a diet that you can eat less with - any diet. That way you'll be able to lose weight running, and youknow you'll lose that fat. Really, any exercise changes your body in many more ways than just burning fuel. It causes your body to build itself in new ways, and triggers different gene expression - which I think is damn cool! First off, exercise (especially intense exercise) improves your insulin sensitivity. This means that when you eat anything that causes you to release the energy storage hormone insulin, you'll use it more efficiently, which means you don't have to release as much, which means that you'll gain less weight. And, surprisingly, exercise (especially aerobic exercise) can help blunt your appetite and decrease your weight without overt caloric restriction. For some reason this has been more pronounced with walking and cycling, but not swimming, in studies. In my experience, exercises have different effects on different people. Weight lifting makes me ravenously hungry, while running and long periods of dancing make me more thirsty. See which one helps decrease your hunger. Though I personally think a lot of people are actually thirsty when they think they're hungry. Try taking a drink of water if you’re not sure whether you are thirsty or hungry, and see if that does the trick. 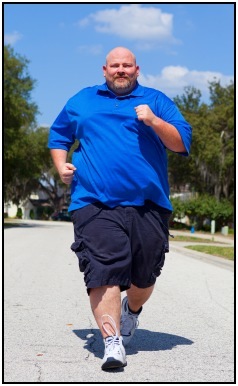 Don't Underestimate The Social Aspects of Running to Lose Weight! Running to lose weight, or any other activity or kind of exercise, gives you an expanded social group. And a lot of people with active interests and hobbies are in pretty good shape! Make friends with them, and they'll help you get in shape. You'll want to be able to keep up with them, and being around active people will make you more active too. At least, that's what I've found. I know that I'm more active when I have a happy and supportive and active friend group. If you're looking to show off your muscles and lose weight, weight loss running (especially strength training and running) isn't for you. You'll just lose muscle mass along with fat, something you definitely don't want to do. Dieted and did weight training to lose fat. Here's where it gets good! All the groups lost weight, as happens when you eat less and exercise. But, the group that did aerobic training showed significantly greater loss of muscle mass than either the weight training and diet or diet only groups! Using your muscles intensely (like when you do weight training) will trigger muscle protein synthesis. That helps you maintain your muscle as you diet down. But lots of time spent doing aerobics will wear away your muscle tissue. So, In A Nutshell, How Do You Make Running To Lose Weight Work? Create a caloric deficit so that you lose the weight. And let your running for fat loss accelerate your dietary efforts. Remember that exercise doestons more to help you than just burn calories. And don't do excessive running to lose weight. 30 Minutes of running is good, 60 minutes tops a few times a week, but any more than that and you'll be wearing down your muscles, not your fat. • Click here to leave 'Why Running to Lose Weight Won't Work For You' & go back to the Home-page! 1. Banting, William. 1869. Letter On Corpulence: Addressed To The Public. London: Published by Harrison. Pp. 12. 2. Babraj JA, Vollaard NB, Keast C, Guppy FM, Cottrell G, Timmons JA. Extremely short duration high intensity interval training substantially improves insulin action in young healthy males. BMC Endocr Disord. 2009 Jan 28;9:3. PubMed PMID: 19175906; PubMed Central PMCID: PMC2640399. 3. G. Gwinup, “Weight loss without dietary restriction: efficacy of different forms of aerobic exercise,” American Journal of Sports Medicine, vol. 15, no. 3, pp. 275–279, 1987. 4. Suh S, Jeong IK, Kim MY, Kim YS, Shin S, Kim SS, Kim JH. Effects of resistance training and aerobic exercise on insulin ensitivity in overweight korean adolescents: a controlled randomized trial. Diabetes Metab J. 2011 Aug;35(4):418-26. Epub 2011 Aug 31. PubMed PMID: 21977463; PubMed Central PMCID: PMC3178704.